Are you pushing off the brake pedal as you attempt to start the engine? 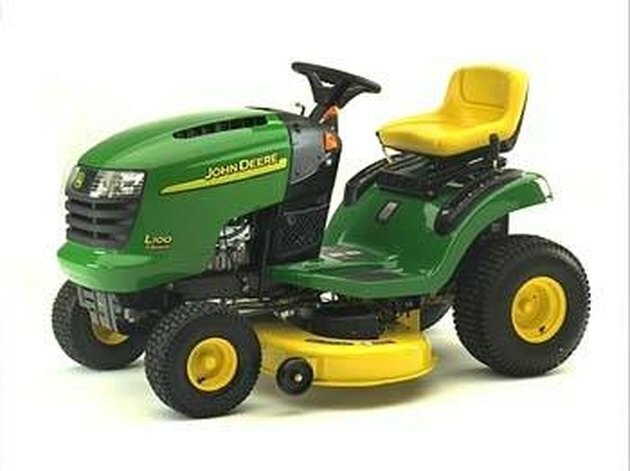 The brake pedal on a John Deere L110 Lawn Tractor must be depressed before the engine will start. Is the PTO engaged? If it is, disengage the PTO and try again. Is a spark plug wire loose or disconnected? Make sure the spark plug wires are tightly connected. Are you using the right fuel for this machine? A minimum of 87 octane fuel is recommended for the L110. Also, fuel that is up to 10 percent ethanol or up to 15 percent MTBE is acceptable. Check the fuel filter to see if it's plugged. If it is, install a new fuel filter. You may have a defective safety switch. The carburetor may not be adjusted properly, and there could be dirt or something else clogging it. The fuel filter may be plugged. This could be caused by old, bad or cheap fuel. Replace the existing fuel filter with a 394358, 5098 (engine without a fuel pump) or a 691035, 5065 (engine with a fuel pump) fuel filter. A spark plug may have worn out. Replace the spark plug with a 491005 spark plug. Fuel goes stale after a few months, or improper fuel may have been added to the tank. Replace the fuel with the fuel recommended above. The electrical connections to the battery may be loose or corroded. The engine oil may be old and thick. Replace the existing oil with a synthetic 5W30 oil to allow for the widest operable temperature range. The mower may be traveling too fast for the amount of grass being mowed. Trim back the throttle to go slower. The grass may be too long to cut at the level it's being cut. The grass may be too wet to be cut. The engine throttle may be too low. Air flow through the bagging system may be impeded. The mower blade belt may be installed incorrectly.